Amazon and Graco are teaming up to bring you the Baby Registry & Graco Sweepstakes. 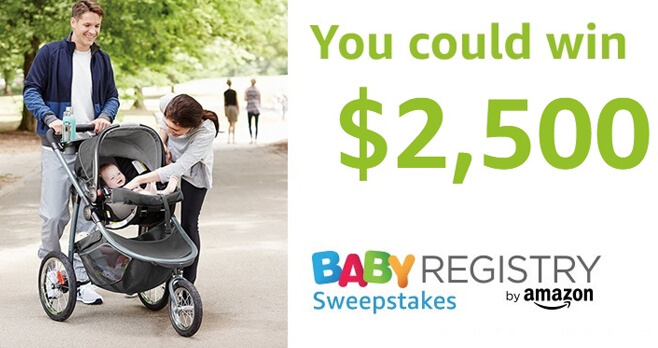 Create an Amazon Baby Registry by June 30 for your chance to win $2,500 for your registry. A new winner every month for 4 months. A total of $10,000 in prizes. Who Can Enter? If you are an individual legal resident of the 50 United States or the District of Columbia and are 18 years of age or older at the time of entry, you are eligible to enter the Amazon Baby Registry & Graco Sweepstakes. When To Enter? Sweepstakes begins at 12:00:01 a.m. (PT) on March 1, 2018 and ends at 11:59:59 p.m. (PT) on June 30, 2018. What Is The Sweepstakes Prize? The Grand Prize consists of a $2,500.00 Amazon.com Gift Card. Who Are The Sweepstakes Winners? After we confirm the winners, we will post the winners’ names at Baby Registry Sweepstakes Winner Page until June 30, 2019.